The Salish Salad recipe was developed by Ellie van Nie for the launch of the Salish apple – a new BC apple variety released in a ceremony at the UBC Apple Festival on Oct 13 in Vancouver. The Salish is one of the first apples to be included in PICO’s (Okanagan Plant Improvement Corporation) innovative new programs branded “Born in BC. Raised in the Okanagan”. 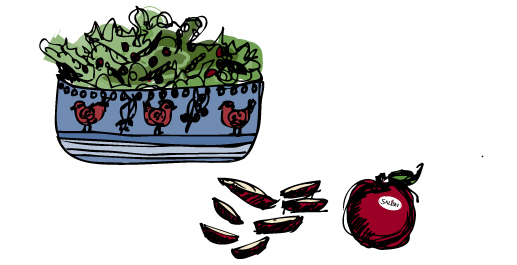 The Salish apple is delightful and goes beautifully with the toasted walnuts, cranberries and goat cheese. To toast walnuts, place small pieces in a frying pan, turn heat to medium and cook turning often until walnuts are fragrant and lightly toasted – maximum 5 minutes. Transfer to dish and let cool. In a salad bowl, whisk together apple cider vinegar, olive oil, apple jelly, salt and pepper. Add sliced apples and coat well with salad dressing to ensure apples do not oxidize and turn brown. Tear lettuce leaves into bite-sized pieces and add to salad bowl. Toss with dressing and apples just prior to serving. Top the salad with toasted walnuts, cranberries and goat cheese.